Once famed as the location of the Old Man of the Mountain, Franconia Notch State Park is now known for its natural beauty, and hiking	and camping opportunities. Franconia Notch State Park (map) offers a wealth of outdoor activities: Lafayette Campground, the Appalachian Mountain Club's system of trails and hikers' huts, a 9-mile paved bike path, trout fishing, swimming in the mountain lakes and rivers, a number of beautiful picnic sites, and a ski area, Cannon Mountain, with an aerial tramway (cable car) which operates winter and summer. Four miles north of North Woodstock, but still south of the Basin, is the Flume, a natural gorge or cleft in the granite. A boardwalk has been erected along the 800-foot length of the Flume, and for an admission fee you can walk through its cool depths, the granite walls rising to 60 or 70 feet above you, mosses and plants growing precariously in niches here and there. Signs explain how nature formed the Flume, and point out interesting sights along the way. Near the Flume is a covered bridge thought to be one of the oldest in the state, perhaps erected as early as the 1820s. 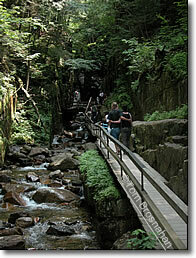 The park Visitor Center (tel 603-745-8391) is here and, like the Flume, is open from mid-April to mid-October.